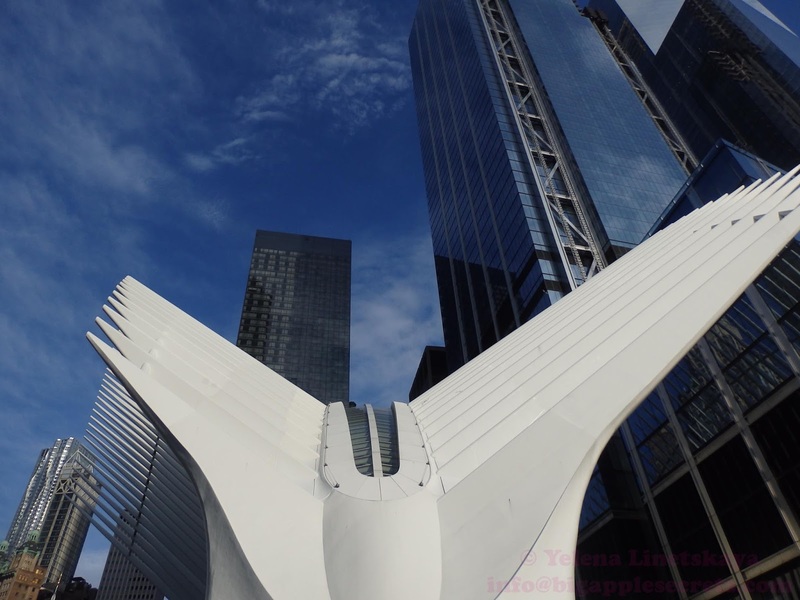 The highly anticipated and expensive new World Trade Center transportation hub was open to the public last July after years of construction. The Oculus design of white wings echoes the Greek Phoenix myth of rebirth from the ashes. Every 9/11, at 10:28 am - the time that the second Twin Tower collapsed - the sun comes beaming in through the skylight. 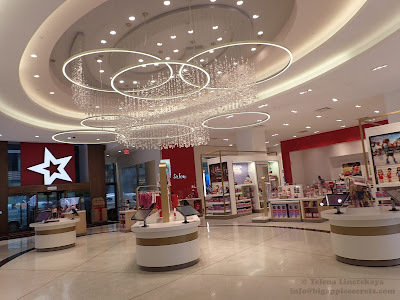 More than 100 retail stores, ranging from the Apple Store to Banana Republic and from Eataly to Fossil, began welcoming customers at the 350,000 square-foot World Trade Center shopping mall. The Oculus serves as a transportation hub that connects 11 subway lines, the Path trains between NY and NJ and the Battery Park Ferry Terminal. 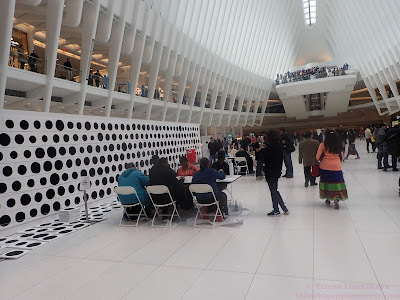 The Oculus is not only a terminal and a shopping mall, It is also a place for art installation. 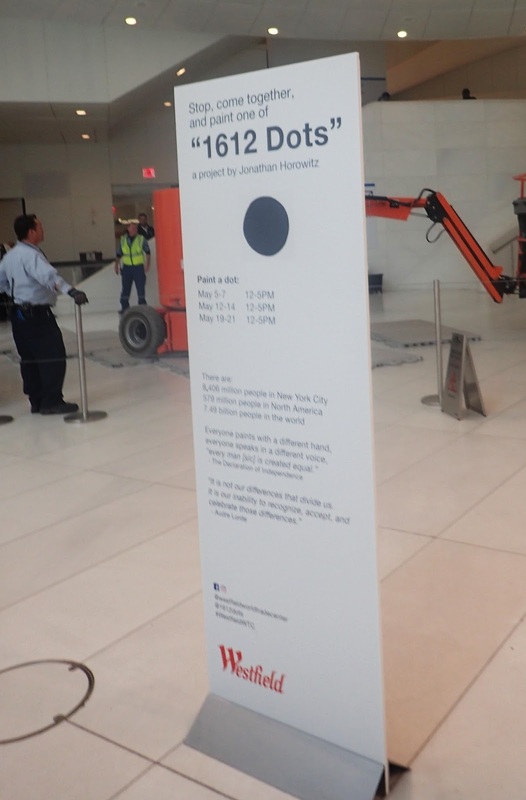 For three weekends in May artist Jonathan Horowitz is inviting the public to come paint 1612 dots. 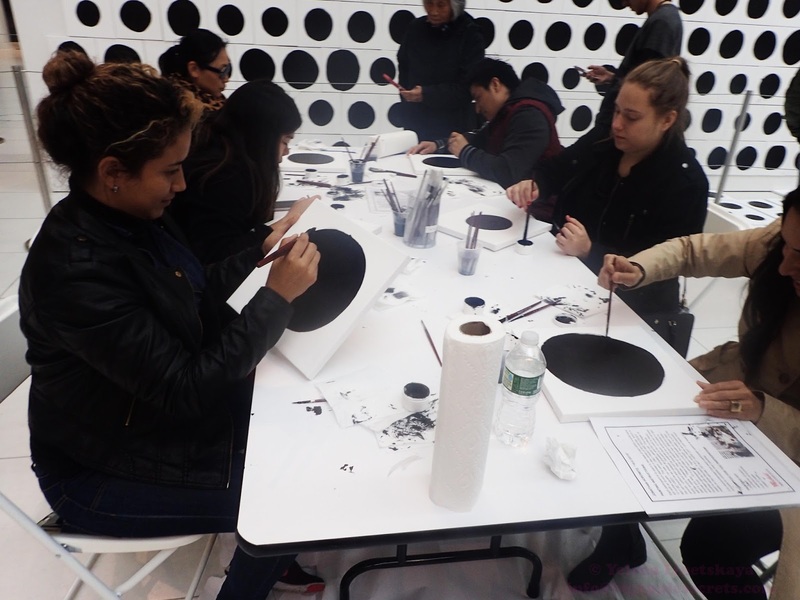 1612 DOTS, is the newest iteration in a ongoing series, and the first major partnership the Oculus has done with an artist in its community programming series on the Oculus floor. New York-based artist Jonathan Horowitz (b. 1966) works in video, sculpture, sound installation and photography and was described by Interview magazine as ‘the cleverest artist alive’. Since the early 1990s, Jonathan Horowitz has made art that combines the imagery and ambivalence of Pop art with the engaged criticality of conceptualism. In 2012, Horowitz’s solo exhibition "Your Land/My Land: Election '12" was presented concurrently at seven museums across the USA. Taking its name from the Woody Guthrie song This Land is Your Land, the show demonstrated America’s engrained political divide. For ‘590 Dots’ in 2014, Horowitz invited 590 individuals to paint a single black dot which proliferated as multiple circles rather than coming together as one picture. He commented that ‘it’s incredible to see all the variations in texture and shape and size that result from the process.’ Each contributor was paid $20. 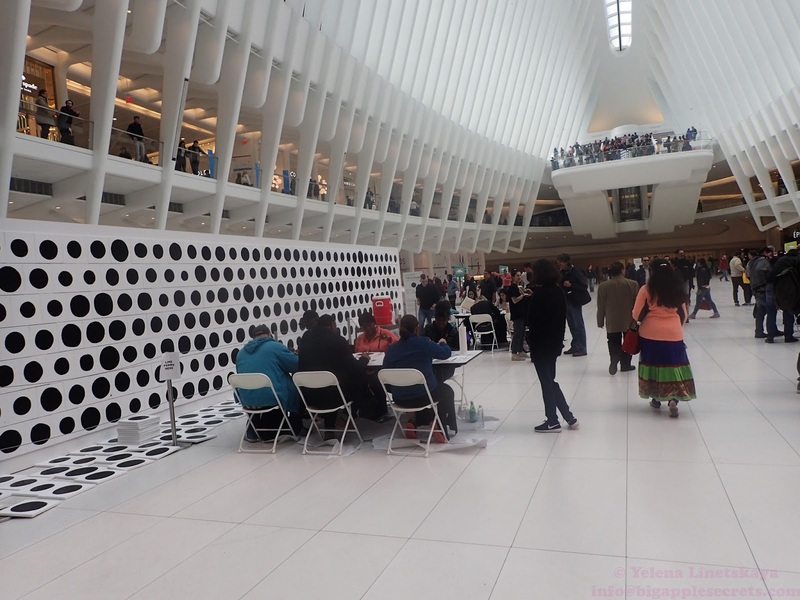 Three weekend in May Horowitz and his assistants set up their pop-up workshop on the Oculus floor’s East end. Tables and chairs are provided for the participants to sit and paint. You also can take part in this performance! Scheduled time is May 12-14 and May 19-21, 12-5PM. The only question that I have - why 1612?